In the Mens 40+ event David Lewin started off with an excellent win, beating Georgia Native Robert Dekle in the first round. In the next round he lost to number 5 seed Craig Bennett from Salt Lake City. In the consolation event David played perhaps the best match of his career to date. Against Adam Walker from Southport Racquet club David went to a 2-0 lead. In the end he lost 3-2 but this was extraordinary. In the National Guest Open – Joe Millman had the misfortune to draw world number 38 Egyptian Yasser El Halaby in the first round. He performed very well scoring several points in each game. He was disappointed in himself for what he deemed poor shot selection, but when one considers he has only been playing four years, his performance was more than creditable. Pat Millman, in the women’s 50+, comfortably won her first round game against Donna Sharpe from DC. However, she faces a stiff challenge tomorrow against Jane Segal from the Southport Racquet club in Connecticut, against whom she has never prevailed – despite frequently having played close games with her. Richard Millman won a straightforward first round match on Thursday against Ron Allnock from Pittsburgh PA, in the 45+event. 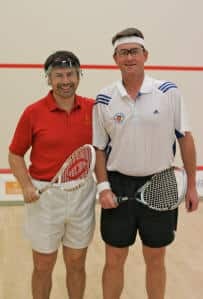 In his quarterfinal match today, Richard participated in an historic game when he played against former US Squash president Eben Hardie III. It was historic because, as far as I know, it was the first time in the United States that two recipients of the Birmingham Hip Resurfacing procedure have ever played against each other. Both Millman and Hardie underwent their respective procedures receiving the Smith and Nephew cobalt chromium prosthesis – Millman in 2006 and Hardie in 2007. After photographs on court where the two both proudly displayed their scars( to the whistles and catcalls from the gallery) Millman prevailed by 3-0. Tomorrow in the semi finals he will face his old nemesis Diniar Alikhan.